Earlier this month, we traveled to Texas. We flew into San Antonio, rented a car and drove up to Lockhart, The Barbecue Capital of Texas, before staying in Austin for the night. 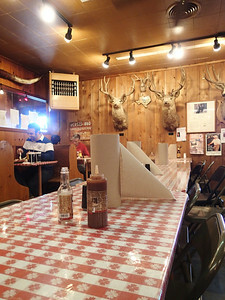 Lockhart is 25 miles southeast of Austin, it may be a small town of 12,000 but it's also where it's good to be carnivore. Central Texas was settled by German and Czech settlers in the mid 19th century, and they brought with them European-style meat markets. While the European settlers did not think of this meat as barbecue, the name stuck since it's what local farmers called it. BBQ here is rubbed with spices and smoked over indirect heat from pecan or oak wood. 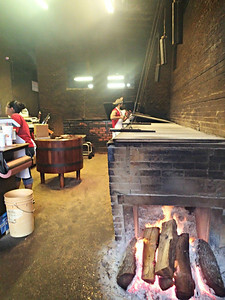 The heavenly scent of the meats smoking permeates the entire city of Lockhart. It is amazing! 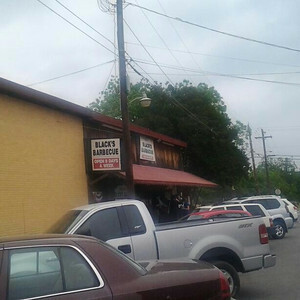 Our first stop was Blacks Barbeque it's open 8 days a week and it was established in 1932. 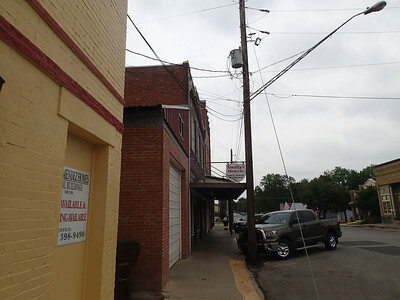 It is one of the oldest barbecue restaurants in Texas that has been continuously owned and operated by the same family. 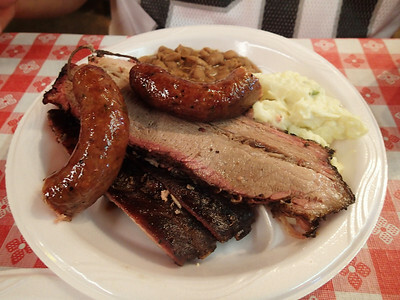 In past years, it's been named one of Texas' 50 best barbecue restaurants by Texas Monthly. When you walk inside you grab a plate and load up on sides from the steam table, then you approach the butcher. You name your meat and how much you want. Meats are sold by pound. Oak is used here to indirectly smoke the meat, which is seasoned only with salt and pepper. Brisket made it's debut at Black's and it is excellent. We liked it best, along with the homemade jalapeno cheddar sausage. We sampled ribs which were delicious, but we later found we liked them better elsewhere. We sampled sides of potato salad, beans and deviled egg. Black's has homemade sauce to accompany the meat since the masses asked for it, but it's better without it. I found it a bit too acidic loaded with vinegar and lemon, maybe a hint of cumin. The dining room is rustic as you might imagine. Though, dining here is somewhat fancy, with styrofoam plates, plasticware and paper towels on the table. Yes, I said fancy. I'll explain more later. 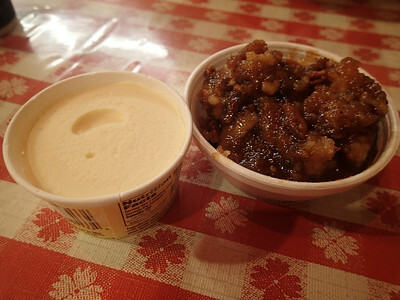 We also sampled the pecan cobbler with a side of blue bell ice cream. Blue Bell is sold in 22 states, mostly in the south, I never had it before. It is a delicious Texas treat. It's perfectly sweet and insanely creamy. After one bite is easy to understand why Blue Bell Homemade Vanilla is the best selling single flavor in the US. This stuff was made for cobbler too. It melts well and cuts the richness of the gooey sweet mess that pecan cobbler. After filling up on the salty meats, the sweetness is welcomed and much appreciated. It's the perfect end to a stellar BBQ meal. Our next stop was Smitty's Market. The history here isn't quite clear, my understanding is that Smitty's and nearby Kreuz Market are all part of the same extended BBQ family. Although, Edgar A. "Smitty" Schmidt purchased the Kreuz Market from the Kreuz family in 1948; Smitty's Market opened it's doors in 1999 in the former Kruez Market location. Confused? Yeah, me too. Its past is local legend and from what I've gathered it sounds like some sort of family feud fueled the split. Whatever the case, meat lovers rejoice. Both are fine barbeque establishments. Smitty's has recently fallen off Texas Monthly’s Top 50 list, but had been named year after year. Smitty's daughter and her family run Smitty's Market today. Her son is now pit master. Walking into Smitty's is life changing. Yes, I said it. Life changing. At least it was for this midwestern-turned-desert girl. Before we even approached Smitty's doors the scent of robust meats smoking filled the air. Walking through the doors, your eyes burn a little from the smoke. You wipe them and you notice the soot that has gathered on the walls from nearly 90 years of smoking meat to perfection - it's been a barbeque restaurant since it was built in 1924. As you walk back toward the pits, you feel the warmth of the open flames burning oak. Pits line the walls in this dark room, three employees stand at the center. The butcher cuts your meat at the greasy cutting block and two cashiers are available to weigh the meat and ring you up. Cash only. In exchange for cash you're handed your hefty meat butcher paper-wrapped package. They point you toward the dining room and you're on your own. 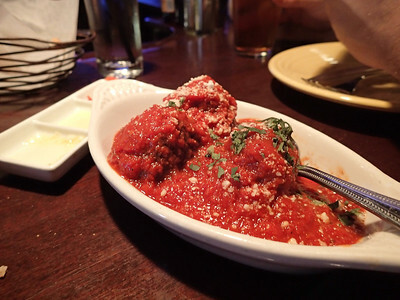 Don't ask for a fork, they don't have 'em. Grab a handful of napkins and sit down. You're given a couple knives and you dig in with your hands. Soda and limited extras and a side of beans are available for sale. Blue Bell ice cream is also sold. Even without the cobbler it hits the spot. On our first visit to Smitty's we had the trifecta of brisket, sausage and ribs. They gave us beef ribs and they were so insanely mouthwatering; we got four more. We stuffed ourselves silly on those ribs. The smoke was perfection, there was a caramelized glazed on top and the fat renders so beautifully when you bite into the flesh it juices like a peach. I've never experienced anything like it. We were high on BBQ and it was glorious. You can get bbq sauce from the counter and theirs is better than Black's. It's the same red-orange color but it has more spice and less acidity. You really don't need it, though. This meat is wondrous on its own. We returned the next day for more ribs, this time we had the pork. They too were out of this world delicious. They hold the smoke so well. They weren't nearly as juicy as the beef, but yet equally tender. Life changing, I tell you. Our final stop on our Lockhart BBQ tour was Kreuz Market (pronounced 'Krites') is more popular with tourists because you can see the large barn from the highway. 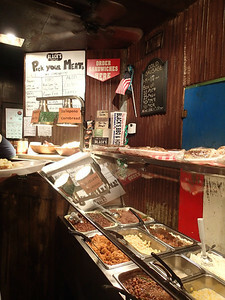 Kreuz Market got its start in 1900 as a meat market and grocery store. 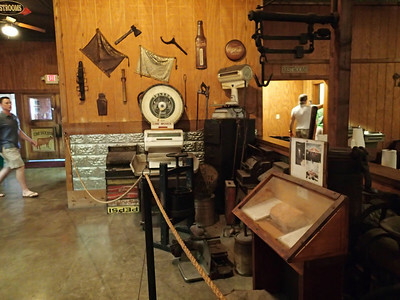 Charles Kreuz Sr. started smoking meats out of necessity because refrigeration was no good and he did not want to dispose of quality cuts that had not sold. Remaining lesser cuts were used to make sausage. 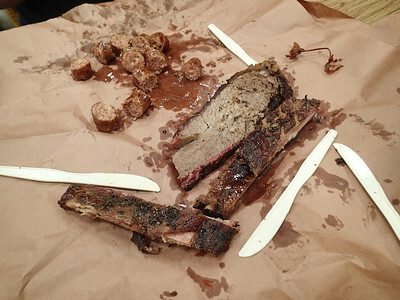 Customers would buy their barbecue and sausage (which was wrapped in butcher paper) and they would eat it on the spot with their hands and a pocket knife. Sauce was never used. This tradition continues at Kreuz today. Edgar Schmidt, who had worked there since 1936, later purchased the market. He then sold it to his sons, Rick and Don Schmidt, in 1984. Fifteen years later, after Don retired, Rick was forced to move into a newer and bigger space a quarter mile north of the old location. Rick has since retired and his son Keith bought out the business. 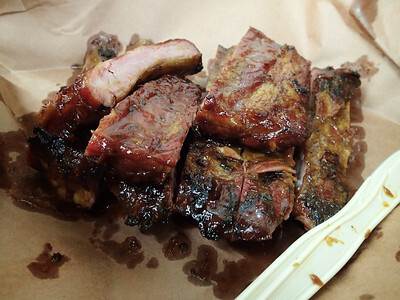 Kreuz Market just recently graced Texas Monthly’s Top 50 list. The brisket here is a real winner. It is succulent and simply wonderful. We gobbled it up in a hurry. Outside of Lockhart, the ribs and sausage would be stellar. 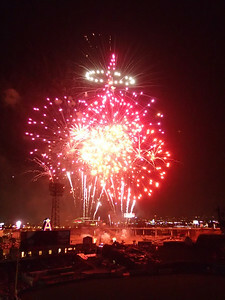 But we had dined at the three most popular BBQ restaurants and we had chosen our favorites. The winner is? All three. Because each one specializes in a slab of meat that puts them above the rest. 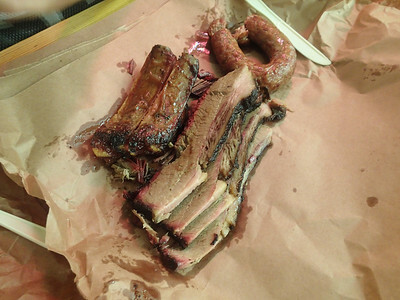 At Kreuz its the brisket, it's leaner and more moist that Black's. Black's sausage is killer though. 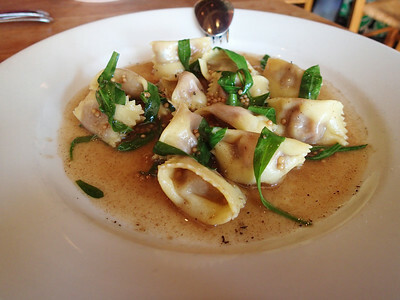 It has the best texture and flavor, and just the right amount of kick. And Smitty's Market has the ribs... Oh, those ribs. A few months ago, Flaming Fajitas was only a month old, we stopped in for dinner while my sister and nephew were visiting. The five of us were eager to try the newest restaurant in the neighborhood. You'd think Las Vegas of all places would have great Mexican, and while it does have a couple gems, it really has a poor showing overall. However, Flaming Fajitas has brought some heat to the scene. I mean that quite literally. I love spice. And Flaming Fajitas delivers. 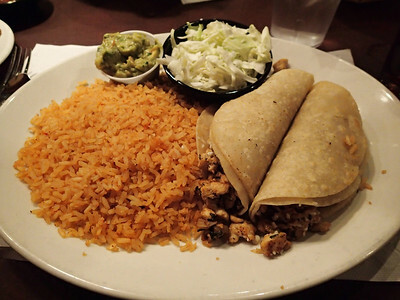 I love the plate of grilled onions and jalapenos that gets you started and the salsa is quite tasty. 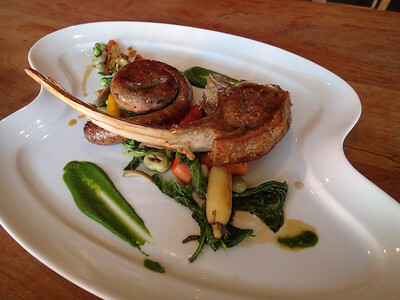 This is often the weak link when I dine out, but it fresh, bold and well balanced. The staff aims to please and they were more than willing to accomodate special requests made by our group. We were started with delicious fideo soup. 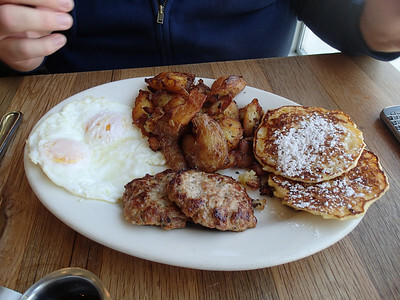 Then, a short bit later, hot plates piled high with food swirled around us. I ordered the tacos al pastor. However, what was presented before me was not tacos al pastor. I don't know if the kitchen made an error or if they prepare them differently but these had no lingering flavor from chilies, nor a hint of pineapple. 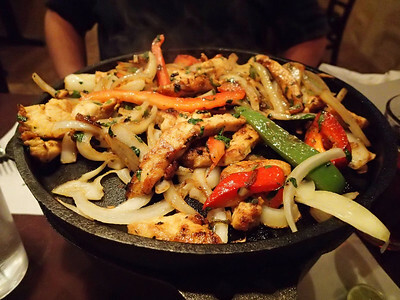 Whatever it was, it was decent, but fajitas is the name on the building and it's what you should get here. My brother went with their signature Chicken Fajitas and there is quite the presentation; far more showy than any fajitas I've seen before. 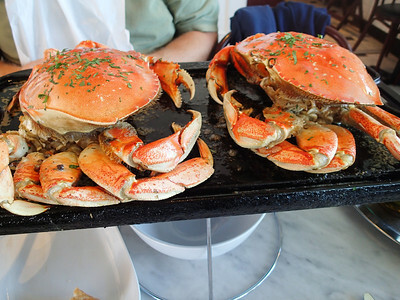 Usually you can hear them sizzling, but these are actually set on fire tableside. The fajitas are excellent. So much so, I took Frank the following night we shared the steak and chicken fajitas for two. The chicken is far better than the steak. I noticed they also offer pork. I will try that next visit. I also prefer the corn to the flour tortillas. They have a great and reasonably priced beer selection to quench your thirst and come for happy hour to enjoy great specials. I've eaten at two Brazilian steakhouses on the strip and was terribly disappointed; I was skeptical of Texas de Brazil, but after so many praises our friend finally convinced us to give this churrascaria a try. I'm not often a fan of chains, but Texas de Brazil won us over. The salad bar is a meal in itself. I love the Italian meats and cheeses. The couscous was excellent and a nice palatte cleanser. 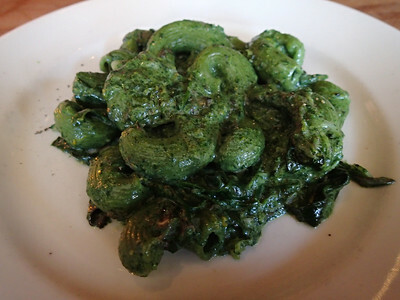 The asparagus provides a healthy dose of greens. Everything looked fresh and appetizing. I'll have to sample more items next visit. At the table, the sides of mashed potatoes, fried bananas and cheesy bread bites are tasty as well. They help dull the saltiness once the meat parade begins. We wasted no time and let the feast get underway. Since it was our first visit we sampled a bite of every offering. Once we found our favorites; we stuffed ourselves silly on lamb chops, leg of lamb, parmesan crusted pork loin and medium rare filet. All were the perfect temperature, well seasoned and tender. If only I could travel with a second stomach! Instead, we had to call it quits before the meat sweats left us comatose. We are such gluttons, we chose the chocolate layer and carrot cake for dessert. Both were large portions easily shared; moist and delicious, but the chocolate layer cake was the better dessert. The dark chocolate layer is so decadent and it's the perfectly sweet end to the meatacular evening. 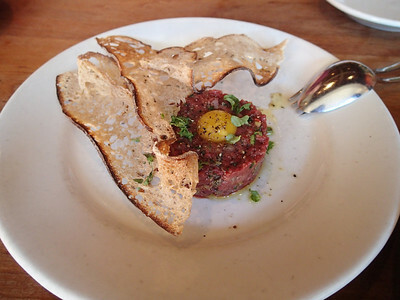 Dress in your fat pants and bask in gloriousness of being a carnivore. Sorry, no photos of this dinner. I was too preoccupied with the meatfest. 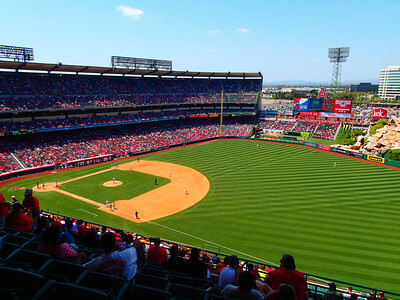 This weekend we spent time in Orange County; we drove down to see the White Sox vs. the Angels. 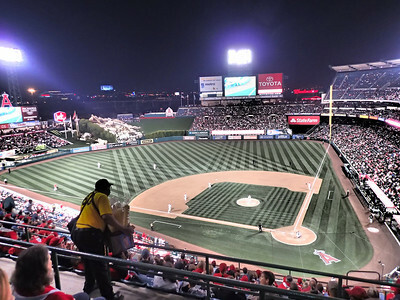 They only have one series in Anaheim this year, which is a real bummer because baseball has just begun, but it's already over me. Frank might see them at home in July. 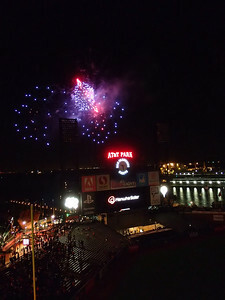 Friday night's game was a winner. 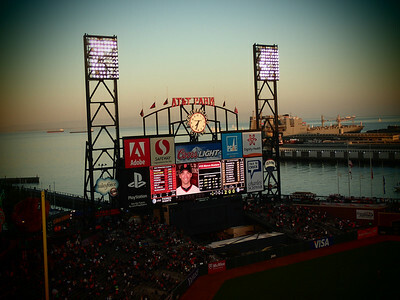 Adam Dunn even hit a homer. I never thought I'd see the day. 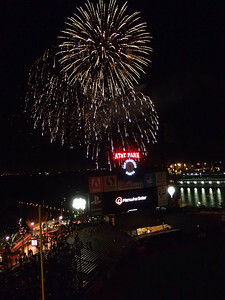 There was a firework display after the game. 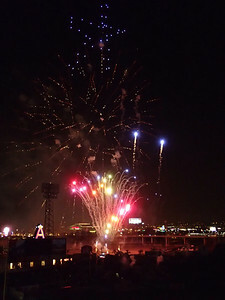 It was a better show than the one with saw last month after the Giants game. 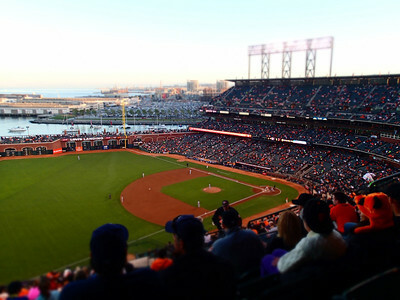 We usually stay at Ayres Hotel for the games, but they were sold out when I tried to book so I booked on hotwire instead. 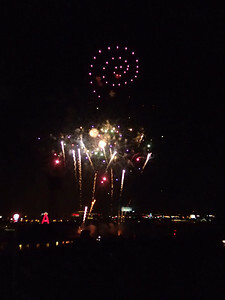 We were set up with Red Lion Hotel across from Disneyland; Tower of Terror to be exact. The hotel was nicer than expected and accomodations were comfortable. My only complaint was the weak shower pressure. The zillions of kids wasn't ideal, but I expected it, I was on their turf so it comes with the territory. What I didn't expect was the lack of bars. We met friends at Fire and Ice for drinks. We were utterly shocked when the lights turned bright at 11:50 signaling last call. The oddest part about traveling is the various liquor laws; Anaheim is no exception. Midnight we were cut off. We walked over to Bar Louie to continue drinking, but it was lame, dirty and filled with drunks. We only stayed for one beer. Saturday, we were up bright and early; headed to LA for Langer's Deli. It's a must whenever we're in the area. Our good friend that is stationed at Camp Pendleton drove up to meet us for brunch. 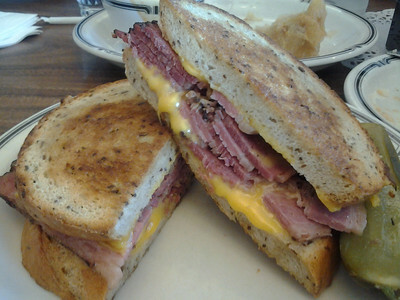 It was too early for potato pancakes but we got a knish to start, and then, pastrami with nippy cheese hit the spot. Langer's never disappoints. 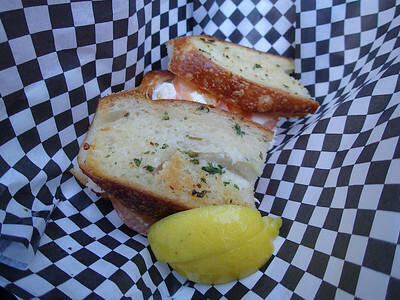 It's definitely one of my favorite sandwiches. After stuffing ourselves silly, we drove back to Anaheim, before going to the game we stopped to get our friend checked in at Days Inn. Turns out there are several Days Inn hotels around Disney and the ballpark. We visited two of them before finding the right one which ironically enough was closest to our hotel. 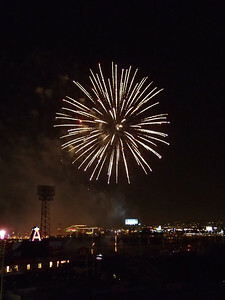 Once that was squared away we headed back to Angels' Stadium for Military Appreciation Day. It was good fun, but we were losers. We can hit, but we couldn't collect enough runs to come out on top. We filled up on peanuts during the game, but figured it was time for real sustenance. We went to Portillo's for dinner. I wasn't thrilled with the beef or dogs last visit so I had the chopped salad this time. Family back home has mentioned how delicious it is. If was fresh and chopped, but the raw red onion was so overwhelming I died of heartburn for the next few hours. Washing it down with a cake shake wasn't a good idea, either. My stomach was terribly upset with me. The guys were satisfied with their beefs, fries and onion rings. I felt like death was upon me so I popped a few rolaids and napped a bit to feel better before we went out for the night. Frank wanted to go to a cigar bar, but I couldn't turn one up. Finding a place that allowed smoking around Disney was a real challenge. Plus, we're picky and prefer places with a good beer selection. Fortunately, Yelp led us to The Globe in Garden Grove. I called beforehand to confirm they had a patio where cigar smoking would be ok. They welcomed us to come on down. We sat out back and rounds of delicious Belgium beer kept coming (each beer has its own glassware - I love details like that). I found a new favorite, Cuvee des Trolls. It's crisp and refreshing, perfect for summer. 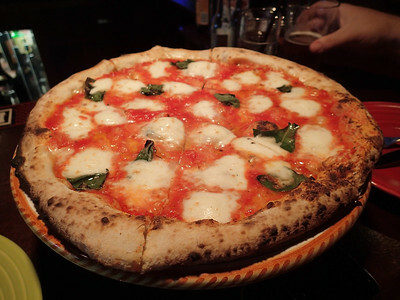 In addition to their regular menu, they have specials every month, each features a new country. May is Mexico and we had a few orders of taqueria duck tacos. They were superb. Next month, they are going to Jamaica, 'mon. I love the concept. I only wish we had the appetite to sample more of the menu - Next time! The owners, Michael and Marijke, are very hospitable, we chatted them both up. Learning about Belgium and the hoops to operate a bar and restaurant specializing in Global cuisine and Belgium beers. Our server was a wealth of knowledge, too. We got to introduce our Coors drinking friend to the world of fine beers. It was a great experience and fun evening. The Globe is a gem, I'm glad we found it. Other fine beers we consumed: La Trappe Quad, La Chouffe, Affligem Blonde, Leffe Blonde, Piraat IPA and Delirium Tremens. Sunday morning, we checked out of the hotel and headed to Costa Brava which is my favorite place for Chile Relleno. They have excellent salsa and chips too. It's become a must stop whenever in the area. They have great corn tortillas and the Chile Relleno is stuffed with cheese and lightly battered. Today's was a bit wet, but still muy bueno. 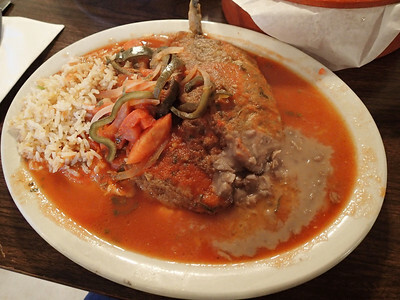 If there is a better chile relleno I'd love to know where. What this one might lack in presentation it makes up for in flavor. 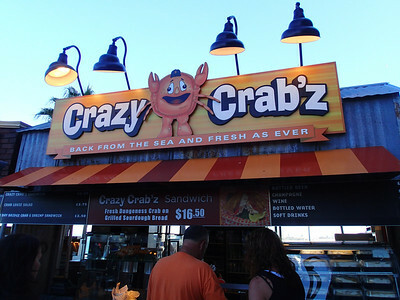 One of these visits I'm going to have to try the seafood and a michelada. 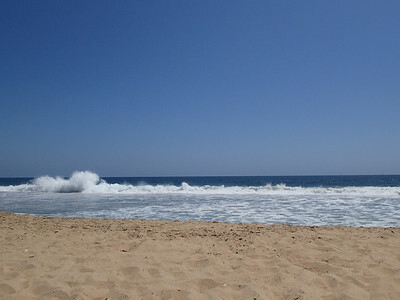 After filling our bellies with Mexican goodness we drove to Newport Beach. I've been a few times, but it was a first for Frank. We actually found meter parking - Amazing! 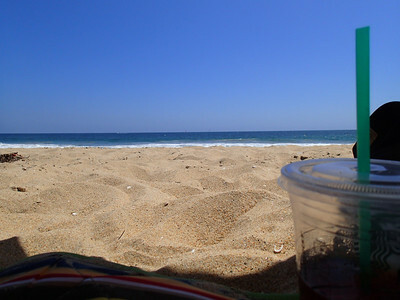 We grabbed the blanket and umbrella and hit the beach. We listened to the Dirty Heads "Cabin by the Sea" enjoyed the sun, the sand and breeze and three hours went by in an instant. We packed up, said so long to the beach and hit the freeway for the four hour drive home. Despite several attempts I have not been able to commit to regular exercise. Mainly, because I find it hard to keep motivated when I get bored to tears on the treadmill and elliptical. 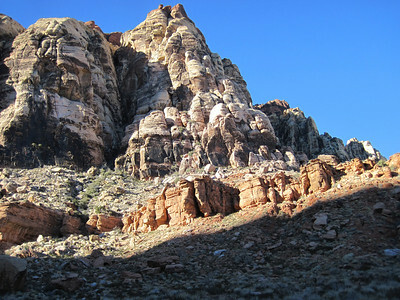 In hopes to improve my fitness level and shed some pounds I started hiking at Red Rock with friends. I love getting out there! It's so beautiful and peaceful. Hiking at Red Rock feels so much more productive. I can breathe fresh air, enjoy nature and get my blood pumping. Now, if only, I could find more time to do it. It's hard to organize with friends on the weekends. We all have such busy schedules. And now that the mercury is rising it's really too hot to hike Red Rock. Mt Charleston is a great alternative in the summer, but its not nearly as convenient. It's a much longer haul from home. So, we'll see how often I get there. 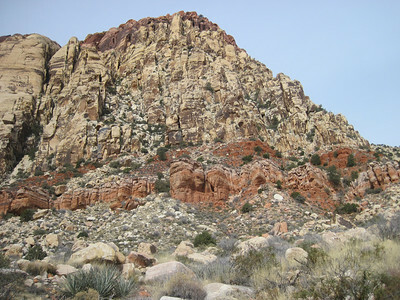 Anyway, I bought a yearly pass to Red Rock and my goal is to hike every trail. So far, I have three under my belt. 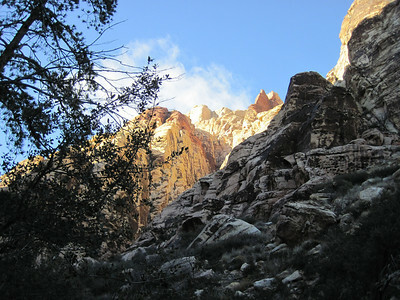 Pine Creek Canyon is the first hike I did this year. 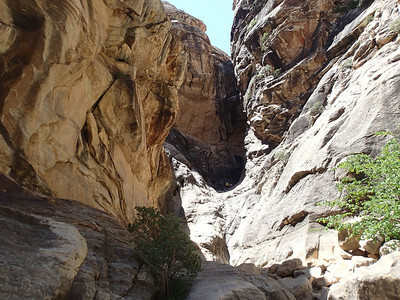 It is a moderate three miles along the canyon walls and it offers stunning views. 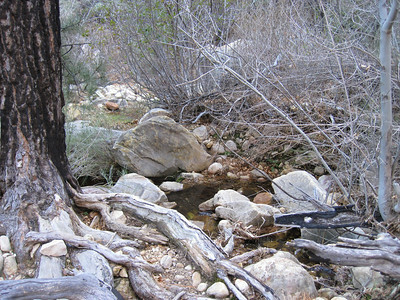 The ponderosa pine forest is able to thrive because of the cool air in the canyon and water from the nearby stream. The forest is remnant of the Ice Age. 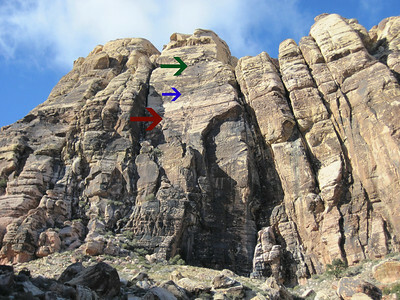 As I understand it the canyon walls are among the best rock climbing in the world. You're sure to see some climbers, just be on the lookout. 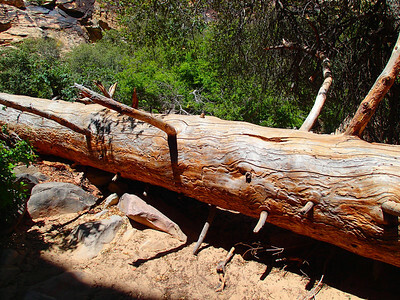 Oak Creek Canyon is the second hike I tackled. It is one of the least popular trails, since it is near the end of the park. 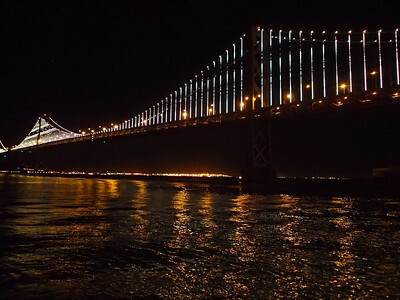 Still, it too, is very beautiful. 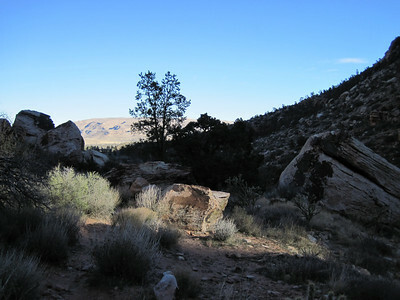 The two mile trail winds through the open desert and over a number of boulders. There was even a small stream. 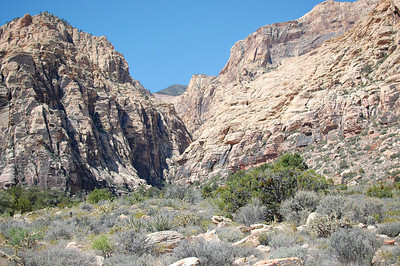 Most recently, I hiked Ice Box Canyon. Frank and I hiked it a few years back and were rewarded with early spring waterfalls. I chose it last weekend since temperatures were in the mid-90's and I knew it would it would be the best hike for a hot day. 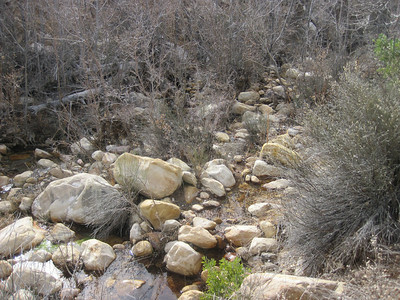 The trail takes you across the open desert before leading you through the cool, shady canyon. 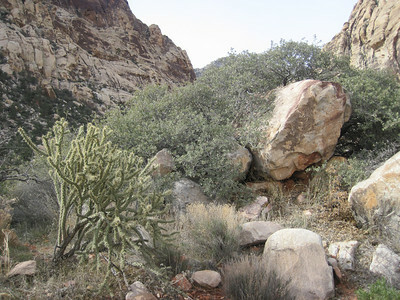 When you pass the wilderness sign you'll encounter large boulders and the remainder of the hike is mainly rock scrambling. It's good fun and a great full body workout. 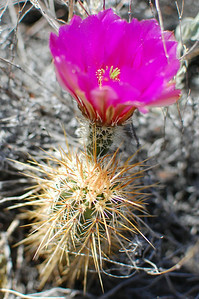 This trip we were too late for waterfalls, but we spotted a few cacti blooms.